The application now uses my component for notifications, replacing some alerts. The start page is the Syntax page. By this way, you can easily get help from the official SQLite site. For example: open and detach the Query Panel, open the SQLite site from the "About" popup in the main window. You can then have a look on the syntax help and on your query in the same time. Some transitions effects have been implemented. This button is present in the SQLAdmin of Christophe Coenraets (used as a starting point) but has been dropped in the very beginning of SQLite Sorcerer dev. This button appears to be really necessary for some SQL operations and at the moment, I couldn’t find a smarter way to address these operations. So the user has now 2 buttons (which is actually confusing from my point of view). Execute query : the typed SQL is executed as a whole or a single statement. - trigger creation : execute query. - import data from a file : execute a batch. 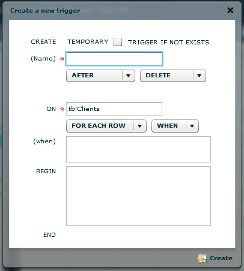 Triggers should be now created without error from the native menu of the Schema tree. I also plan a migration to the MATE framework but I still don’t know exactly when… v1.6 depending on the content of the v1.5… but the sooner the better. I hope you will appreciate this version. And once again, don’t hesitate to send me feedbacks or bugs. They will be all taken into account whatever you are a donator or not ;). Go to SQLite Sorcerer’s page. Help me improve my blog by rating this post or sending a comment.